The colour is tawny and the texture shows small tears with slow legs first and later fat sticky tears that do not move at all (almost). The nose offers a herbal and leathery profile with notes of shoe and furniture polish (turpentine and the like) beside some nice wooden aromas. It is quite interesting AND I like it (despite it is not my favourite profile at all). If you like to smell people in old wardrobes sitting in old furnitures in the library of an old house - this one is for you! The whisky arrives warming and coating in the mouth with some adstringent feelings from heavy tannins that get a little bitter after awhile (it should have been bottled some years earlier). The taste is on a bitter-sweet profile with lots of different flavours that pop up when chewing it for some time. Imagine you have several different cups of tea with different chocolate cookies in the room mentioned above. This is pretty nice, actually and very entertaining. The finish is of medium length and dries out a little (like a bitter tea). Water is not needed as it turns the dram rather bitter (what often happens with heavily sherried whiskies). PS: By the way, this bottling was done from a first fill sherry cask no. 1614 that yielded 258 bottles (according to G&M). The price was not as silly as today's price point is (back upon its release in 2012). 94 points. Do I have to say more? One of the best whiskys I could taste! Heavy sherry. Sweet and sticky. Also oak is with me. Leather resonates. Chocolate - dark as well as milk chocolate. Herbal sweets (Ricola) are here. A freshly baked plum and cinnamon pastry is standing around somewhere, it's still quite warm. Somebody poured some sweet syrup over it. Or was it the Maggifläschchen? Probably both! After inclusion of the palate, the chocolate becomes more intense and rosemary is still quite easy. Full and sparkling. Very sweet with cherries and plums. The oak tree is everywhere immediately and captures the mouth with a tingling sensation. She lets something through Taabk. Then she lets dried fruit through, fermented fruit, dusty wall unit that absorbs all the sweetness for a moment. The Nachschmecken is initially sweet and sticky, then getting drier. Eternally long and dry with dark fruits. Phew, already a board in the mouth, the slightly dusty would prefer to wished out but a lot more is not more, is not quite my whisky style but still a wonderful malt after half an eternity. Schcolade in various variations, raisins lead. In the beginning, slight Liebstöckl echoes and a bit musty forest soil, but the chocolate quickly gives way. Long finish that has little bitterness or excessive wood. Class malt. Tasted in the Brühler whisky house on 9.12.2017. Gordon & MacPhail Speyside Collection Tasting. Nose: Smoky almost phenolic with spices and aromatic aromas. The sherry begins to dominate. 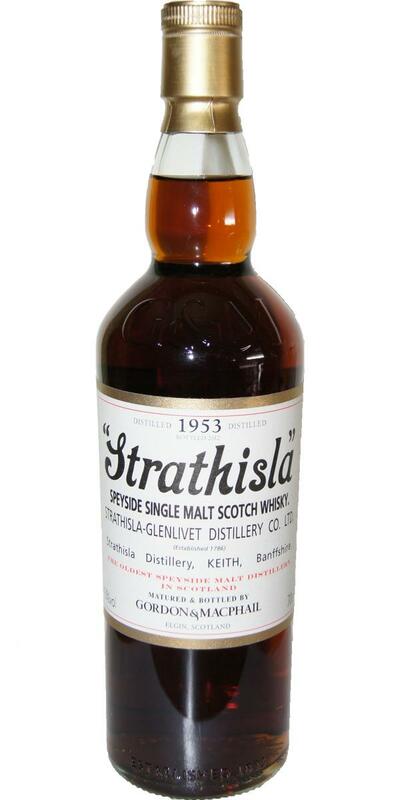 Palate: Rich, fermented fruits laced with smoky, peaty flavours. Finish: Sherried - almost Islay in style.